전 세계적으로 올빼미목 조류는 136종이 알려져 있으며, 그 가운데 올빼미과 조류는 126종이다. 우리나라에서는 10종의 올빼미과 조류가 기록되어 있다. 올빼미의 몸길이는 약 35㎝이다. 머리와 등은 회갈색으로 흰점무늬가 많고, 가슴과 배는 잿빛을 띠는 흰색으로 갈색의 점무늬가 많다. 구부러진 부리는 황색이고 발은 살색이다. 나무에서 생활하는 흔하지 않은 텃새로, 낮에는 나뭇가지에서 앉아 움직이지 않고 밤에 활동한다. 들쥐, 작은 조류, 곤충류를 먹고 산다. There exist around the world one hundred thirty-six known bird species belonging to the order Strigiformae. Of these, one hundred twenty-six are of the owl (Strigidae) family. In Korea, ten species of the owl family have been recorded. 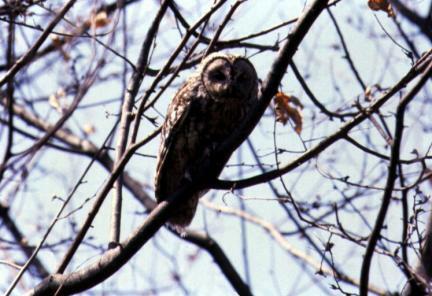 The tawny owl (Strix aluco) is about 35㎝ long. The head and the back are greyish brown in color with profuse white mottling. The breast and the belly are greyish white with brown spots. Its hooked beak is yellow, and the talons are flesh-colored. One of the very few birds that make their nests in trees, the tawny owl stays perched immobile on a tree branch during the day, and leaves its nest at nightfall to hunt. It preys on wild mice, small birds and insects. Owls and true owls are today threatened due to the contamination of their food supply. The destruction of their habitats and breeding and wintering grounds is another contributing factor, along with poaching, to their rapidly dwindling numbers. Owls and true owls are protected bird species worldwide. In Korea, seven of the ten locally recorded owl species are protected under designation as Natural Monuments.